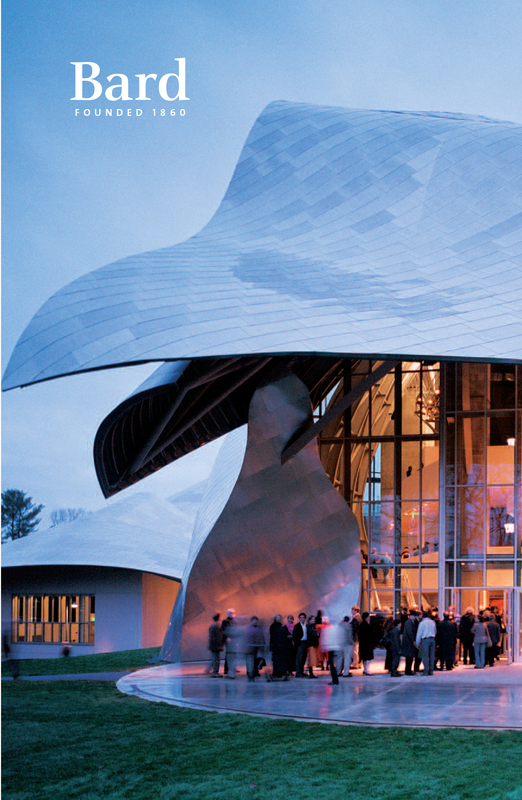 The Bard College Conservatory of Music opened in 2005, continuing Bard’s spirit of innovation in arts and education. The Conservatory offers a five-year, double-degree program at the undergraduate level and, at the graduate level, programs in vocal arts and conducting. At the graduate level the Conservatory also offers a nondegree-granting Advanced Performance Studies program and a two-year Postgraduate Collaborative Piano Fellowship. All Conservatory undergraduates are enrolled in a unique five-year, double-degree program leading to a bachelor of music and a bachelor of arts in a field other than music. In this way promising young musicians pursue all of their interests at one institution, taught by experts in each field. The integrated five-year program combines the benefits of an intensive world-class musical education with the advantages of a broad exposure to the liberal arts and sciences. The Conservatory offers unparalleled musical opportunities for its students, including a concerto competition, orchestral performances both on campus and in national and international concert tours, chamber music concerts at Bard and elsewhere, and performance in the annual Bard Music Festival. Visiting performers and composers present master classes and concerts that are open to the entire Bard community. The curriculum for the BA degree is the same as for any Bard undergraduate, including the Language and Thinking Program, First-Year Seminar, Citizen Science, fulfillment of distribution requirements, Moderation, and a Senior Project. Conservatory students have access to the resources of the Bard Music Program, including faculty, libraries, facilities, and courses (such as electronic music, jazz, and world music). The Conservatory’s undergraduate program accepts applications from students of composition and the following instruments: piano, violin, viola, cello, bass, harp, percussion, flute, oboe, clarinet, bassoon, French horn, trumpet, trombone, and tuba. Voice instruction through the Conservatory is only offered at the graduate level. Undergraduate voice is offered through the Bard Music Program. The crafting of each student’s double-degree program is an individual matter, developed through careful consultation between student and faculty. As a general rule, the program requires five years (10 semesters) to complete. Courses and workshops prepare students to work successfully in the music world after graduation. The Conservatory experience comprises the following five dimensions, which are designed to integrate with the student’s work in the College. Bard retains one of the key components of a traditional conservatory education: the opportunity for students to develop mentoring relationships with master artists. As an important center of professional musical activity in the New York City region, Bard attracts world-class faculty who believe strongly in the mission of its Conservatory. Studio instruction is required in every semester of enrollment. Chamber music plays a particularly important role at the Conservatory, and participation is required of all performance majors, each semester. In addition to performing the standard masterworks of the chamber music repertoire, students work closely with the Conservatory’s Composition Program, performing works of the 20th and 21st centuries. Studio faculty members often participate in ensembles so that students can learn firsthand from the playing of more experienced musicians. The Chamber Music Program is further enriched by frequent master classes and concerts by guest artists. The growth gained by rehearsing and performing music with peers in a large ensemble is an irreplaceable part of the education of any orchestral musician. Bard places considerable emphasis on this aspect of the Conservatory experience; participation is required of all orchestral musicians, each semester. The Bard College Conservatory Orchestra performs twice each semester in The Richard B. Fisher Center for the Performing Arts at Bard College. Under its music director, Leon Botstein, and distinguished guest conductors—such as Harold Farberman, Guillermo Figueroa, Xian Zhang, James Bagwell, David Alan Miller, Rossen Milanov, Marcelo Lehninger, and José-Luis Novo—the orchestra performs the core works of the symphonic repertoire. The orchestra’s additional performances have taken place at major venues in New York City and Boston, and at local correctional facilities through the Bard Prison Initiative. The Conservatory Orchestra has also toured internationally in Asia, Europe, and Cuba. The Core Sequence is a unique four-semester course that integrates the study of music theory and music history. In the first semester students take an intensive course in harmony and counterpoint. In the second semester students study musical form through the composition of pieces in a variety of historical styles. In the third semester, students learn free composition, working with Bard composition faculty. Finally, in the fourth semester’s capstone Conservatory Seminar, students examine works they are studying in their studio lessons and in orchestra. Using these works as illustration and point of departure, students deepen their knowledge of the diverse theoretical structures and historical contexts that inform the composition of a piece of music. In addition to the four Conservatory Core Sequence classes, two upper-level music history classes are required. Students are also required to take, or test out of, two advanced Aural Skills classes. All Conservatory students are required to give a Graduation Recital, to demonstrate their musical strengths and artistic goals. Composition students produce a program of their work, which is performed by the Da Capo Chamber Players (in residence at Bard), their fellow students, faculty members, or other outside performers. Requirements for the dual bachelor of music and bachelor of arts degrees are summarized below. For sample study plans and more information, see the websites of the Conservatory (bard.edu/conservatory) and the College (bard.edu). There are 10 distribution requirements (each a 4-credit course). Two can be fulfilled in the Conservatory (Practicing Arts and Analysis of Art) and possibly one or two within the student’s bachelor of arts major. Advanced standing or college credit for College Board Advanced Placement courses may be given for the grade of 5. Students who wish to request credit or advanced standing must submit the appropriate record of their grade to the Office of the Registrar. The following international diplomas may be accepted for advanced standing: International Baccalaureate, French Baccalaureate, Swiss Maturity, and German Abitur. Students who have earned A-level passes may enter with advanced standing. In addition to applying to Bard College, candidates for admission to the Bard Conservatory must complete the Conservatory supplemental application and, if they have passed prescreening, must audition, either in person or by submitting a video. Applicants in composition must send at least two scores with recordings. For details, visit bard.edu/conservatory/undergraduate/admission. The annual tuition and fees for the Bard Conservatory are the same as for Bard College. Note, however, that the Conservatory program usually requires five years rather than four. For information on fees, expenses, and financial aid, see the “Finances” chapter in this catalogue.